Two cars crossed the finish line of the 2019 Africa Eco Race’s Stage 7 last week like a tumbleweed of metal and rubber. Unbelievably, everybody walked away from what commentators called an “almighty crash” uninjured. Skip to the 04:25 mark in this race recap video and behold one of the gnarliest off-road wipeouts recorded on video. The crash came within sight of the finish line of the 300-mile Mauritanian stage between Northern Station and Chami. Overall race leader Dominique Laure and co-driver Christophe Crespo had the lead over Sergey and Aleksandr Kuprianov when Sergey Kuprianov approached at high speed and broadsided Laure, hitting the rear wheel of Laure’s buggy and sending both vehicles into a barrel roll. All four were able to climb from their buggies. Those buggies are called Optimus’, made by a company called MD Rallye Sport specifically for this kind of racing. They’re small and powerful; just about 3,300 pounds and propelled by 6.2-liter V8 engines according to the manufacturer’s website. Both cars here were trashed, obviously. Here’s what an Optimus looks like before it gets mercilessly thrashed. 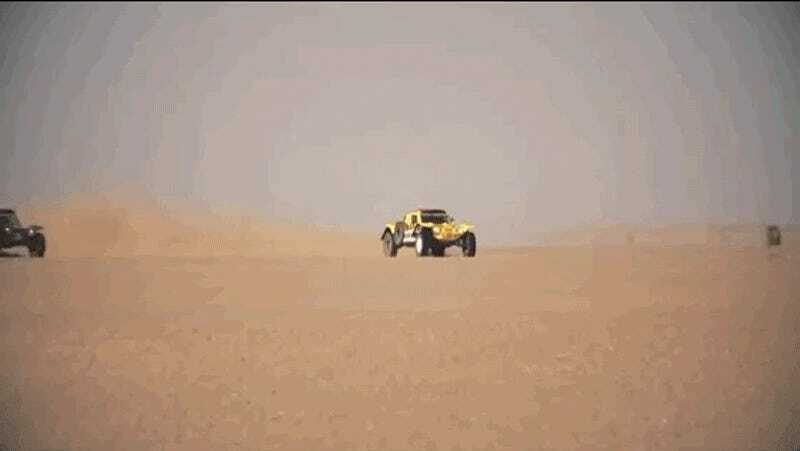 The Africa Eco Race is basically what the Dakar Rally was when it still went to Dakar. This year the route was over 3,700 miles, from Monaco to Dakar. The race itself started with the new year and finished Jan. 12 Cars, motorbikes, buggies and big trucks all charge their way across the desert over many days in a test of physical and mental fortitude. The 2019 Africa eco-race was won by Frenchmen Jean-Pierre Strugo and François Borsotto, who had an Optimus buggy just like the ones in the wreck. Actually, Optimus buggies took first, second and third place. The top team completed that map unit 44 hours, 49 minutes and 58 seconds of race time. On two wheels, victory went to an Italian named Alessandro Botturi who finished on a Yamaha in 46 hours, five minutes and 13 seconds.